This is a specially propagated form of the arboreal growth of the native ivy Hedra helix. It is a glossy evergreen, compact shrub and will happily grow in a container on your patio all through the year. Ivy flowers are very important late nectar for butterflies, moths and bees before they go into hibernation. After the flowers come the black berries which the Blackbirds and others will enjoy in winter. But Ivy normally only flowers on its second stage 'arboreal' growth (ie. 'tree-like'). It takes several years to get to that stage and has to grow far up into trees or buildings. 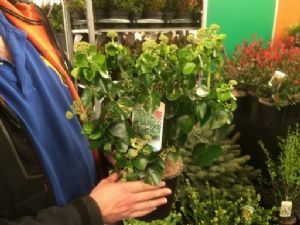 BUT this special little shrub is propagated from just the arboreal growth, so smaller gardens can have ivy flowers without the enormous aged growth!